Reaching losses of $2/bbl yesterday, WTI crude managed to claw back most of the losses to settle just 1.3% lower for the day, while fuel prices saw losses under a penny. This afternoon prices are tapering down just slightly, relatively close to yesterday’s closing price. Crude oil is trading at $53.84, a loss of 72 cents (-1.3%). Fuel prices are also trading in the red this afternoon. Diesel prices are trading at $1.9027, down 0.5 cents since yesterday’s close. Gasoline prices are $1.4270, down 0.5 cents. US sanctions on Venezuela are expected to have a disproportionate impact on diesel prices in the coming weeks as refineries lose access to one of their leading suppliers of heavy crude. Unlike America’s light WTI crude which is optimal for gasoline production, heavier crudes like Venezuela produces are ideal for diesel output. 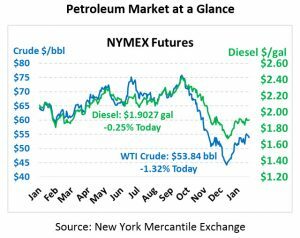 With diesel markets tight and gasoline abundant, these sanctions could cause disproportionate pressure on both markets. Refiners used to processing heavy crudes are pursuing more expensive supply options from Canada, Mexico, and even Iraq to make up for the loss of Venezuelan crude, which could translate into higher fuel prices at the pump. 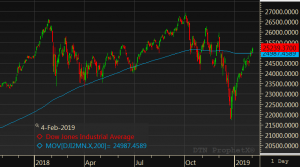 US stocks recently rose back above the 200-day moving average, a sign of positive momentum after stocks languished at the end of 2019. The Fed’s more dovish tone at their recent meeting has calmed concerns that interest rates would tighten too quickly. Oil markets have been taking their cues lately from equity markets, treating them as a proxy for economic activity. Citi analyst Ed Morse forecasts that oil markets will continue to be unpredictable for the remainder of Q1, noting that the market “nightmare” has not yet run its full course. After trading in an enormous $35/bbl range in Q4, it’s hard to predict a stable range emerging this quarter. Sanctions, trade tariffs, OPEC cuts and US supply are all factors that could cause short-term price fluctuations. Over the course of the year, Citi expects Brent prices to rise to the mid-$60s, hitting $70/bbl by year end.